They may be struggling with the language, but when it comes to playing football in Germany, English teenagers Jadon Sancho and Reiss Nelson are making themselves perfectly understood. The 18-year-olds have both seized their chances in the Bundesliga and are expected to play key roles in the Champions League this week. 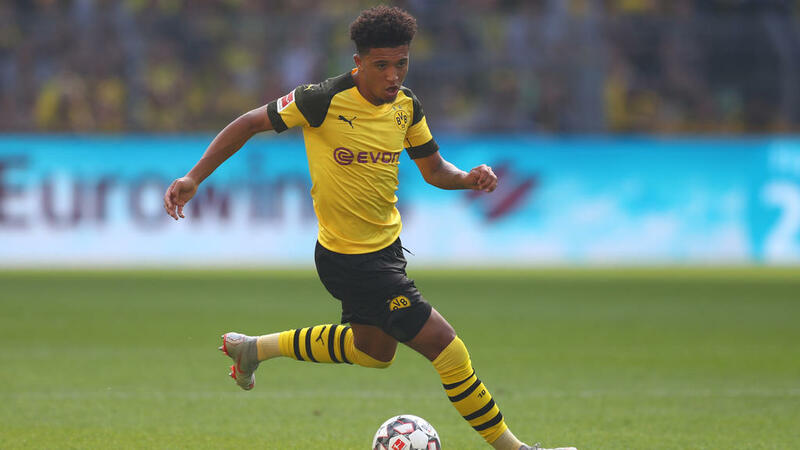 Sancho joined Borussia Dortmund in August 2017, rejecting a contract extension at Manchester City, while Nelson is on loan at Hoffenheim from Arsenal. Both admit playing in a foreign country presents particular challenges, not least the German language. Sancho conducts his interviews in English but admits he's "working on my German" while Nelson has the advantage of having a German father. "I've settled in well and I'm enjoying it. My dad is German too, from near Munich, so I knew what to expect and I'm learning the language with an app --it's going well," explained Nelson. He has plenty of family support in his new surroundings -- his mother, sister and brother all temporarily moved to Germany to help him settle in. "Sinsheim is a little village where everyone loves football," he told the Daily Mail recently. Fresh from winning his first cap for England, Sancho opened the scoring for German league leaders Dortmund in Saturday's 4-0 thrashing of Stuttgart. Sancho should keep his place against Atletico Madrid for Wednesday's Group A showdown in the Champions League, but was quick to acknowledge the first-team opportunities Dortmund give him. "Honestly, them giving me opportunities at such a young age, I just have to thank the club and all my family that have been behind me from the start," Sancho told Sky. "I am really happy to be part of this team and just have to keep working hard in training." Sancho has dazzled with six assists and two goals in the Bundesliga, forging a potent partnership with Germany star Marco Reus. Not to be outdone, Nelson netted with a volley, then claimed a superb second goal from a tight angle in Hoffenheim's 3-1 win at Nuremberg on Saturday. His performance suggests he will also play against Lyon on Tuesday. His Bundesliga brace capped a brilliant week for Nelson, who also scored with a free-kick for England Under-21s against Scotland after netting as a sub in a 7-0 thrashing of Andorra. The first-team exposure Sancho and Nelson are enjoying is payback for the gamble they took on the Bundesliga. Sancho recently extended his Dortmund contract until 2022, which has no release clause. "It's going to be a big game for us," said Sancho before the Atletico clash with both Dortmund and Madrid having won their first two games. "We'll give it our best." Nelson and Sancho are just the latest English imports to German football after Ademola Lookman, 21, spent last season at RB Leipzig and Reece Oxford, 19, was at Borussia Moenchengladbach. In previous generations, the likes of Kevin Keegan, Owen Hargreaves, Mark Hughes, Paul Lambert and Tony Woodcock all enjoyed successful spells for British players in Germany. Nelson has four goals in four Bundesliga appearances having signed a five-year deal with Arsenal before heading on loan to Hoffenheim. "A loan wasn't always my first option, but when I heard the Bundesliga and Hoffenheim was an option for me and working with the manager (Julian Nagelsmann) there, it was something I wanted to do," Nelson told The FA's website. "Julian's a great manager and he's got belief in young players so it's a good place for me to go and play. "It was hard to leave my boyhood club Arsenal, but I know I have to put that on hold and go and play abroad to get some experience in Germany." Nelson's arrival in Sinsheim coincided with the end of Germany winger Serge Gnabry's loan from Bayern Munich. "What he (Nelson) brings with his tempo and his one-on-one ability, we didn't have so much of that in the squad," said Nagelsmann. "Reiss is a player whose qualities can be compared to those of Serge Gnabry, but just not so well developed." Nelson arrived in Hoffenheim with glowing references. Former Arsenal defender Martin Keown says Nelson has "the sort of touches you often see or associate with a Neymar or a real top player". After Sancho made the step up to the senior English team, Nelson hopes to follow as England manager Gareth Southgate is clearly keeping an eye on Germany. "Gareth has made it clear that the pathway is there so if you're young and you're good, he'll give you a chance," said Nelson. "I'm trying to get in there and do my magic."